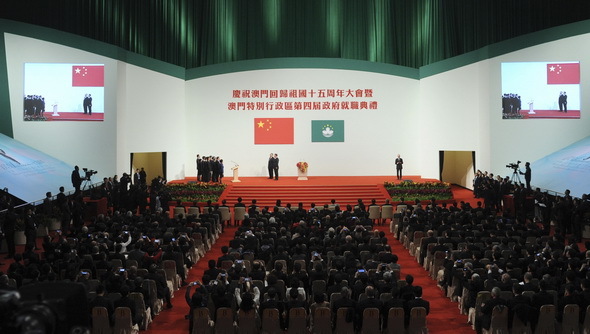 Chui Sai On (崔世安), chief executive of the Macao Special Administrative Region (SAR), said here on Saturday of December 20 that he will spare no effort in implementing the principles of “one country, two systems”, “Macao people governing Macao” and a high degree of autonomy. Chui, in his inaugural address, also stressed the importance of full, comprehensive and correct understanding and implementation of the Basic Law. 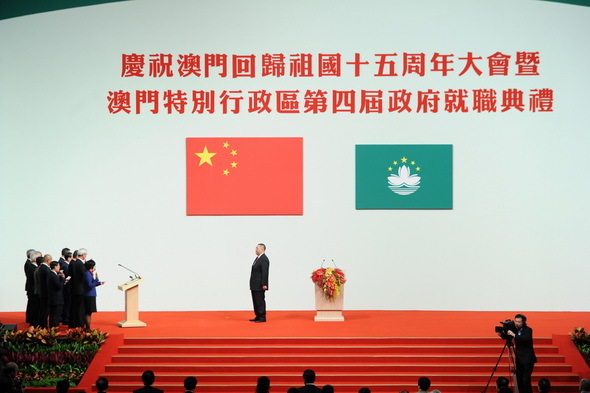 “We will unswervingly support the national sovereignty, security and interests, and safeguard the long-term prosperity and stability of the Macao SAR,” Chui said. He said Macao, a family member of China, has secured the foothold with the support of the motherland since its return 15 years ago. In Macao, said the chief executive, the principle of “one country, two systems” is demonstrating its tremendous advantages and vitality. 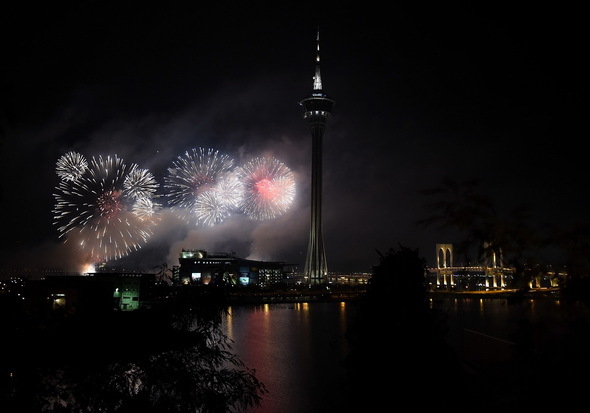 “It proves that if our motherland fares well, so will Macao,” he added. 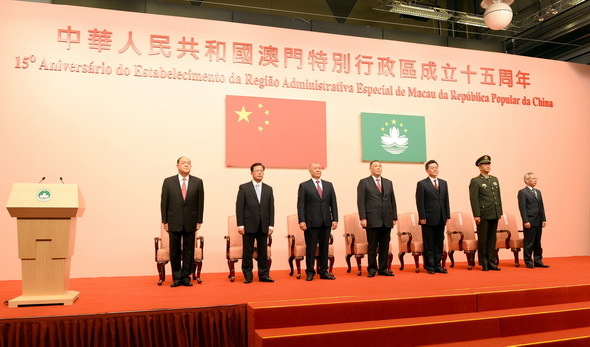 Chui was sworn in as the fourth-term chief executive of the Macao SAR on Saturday. 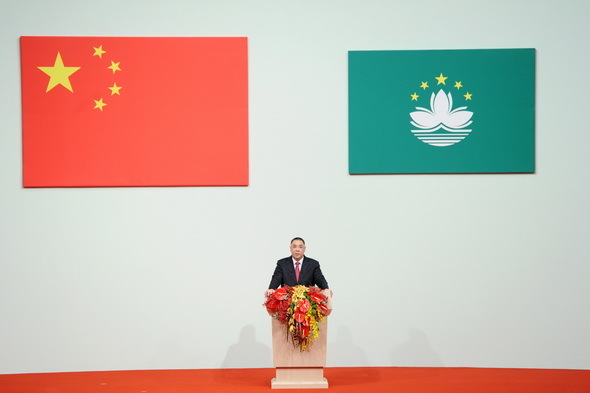 the 15th anniversary of Macao’s return to the motherland in Macao on December 20, 2014.
fourth-term chief executive and government of the Macao SAR on Saturday morning. Chui Sai On, chief executive of the Macao Special Administrative Region (SAR), said here on Saturday of December 20 that the government will continue to give priority to stable economic development and orderly adjustment of the economic structure. 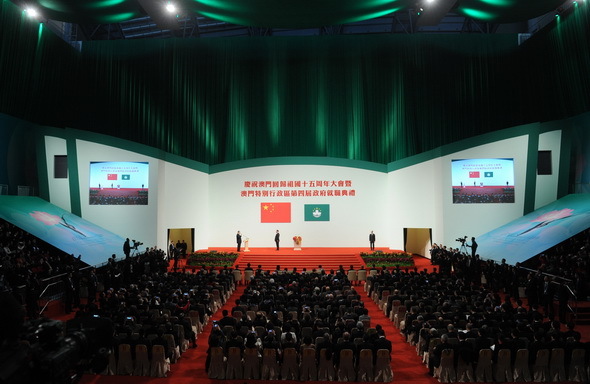 Chui, in his inaugural address as the fourth-term chief executive, pledged to push forward the region’s economic diversification. “Adequate economic diversification is the inevitable choice and long-term strategy for the development of Macao’s economy,” said the chief executive. Chui stressed the importance of the top level design of establishing the region as a world tourism and leisure center. The region is adjusting the scope of the gaming industry, promoting integrated tourism, cultivating new and emerging industries including the convention and exhibition business, said the chief executive. 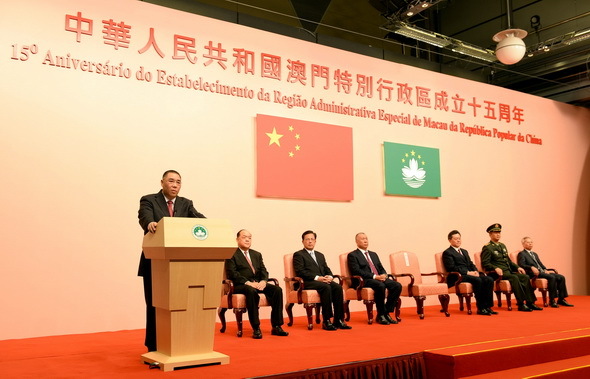 He said Macao must secure its role as a service platform for commercial and trade cooperation between China and Portuguese-speaking countries, become thoroughly involved in international interactions, and integrate local development into China’s growth. Chui said he fully understands Macao people’s expectation for quality living and healthy growth of their younger generation. “We are accountable to prioritizing the enhancement of people’s well-being, expediting the development to make Macao a liveable city with favorable working environment,” he said. 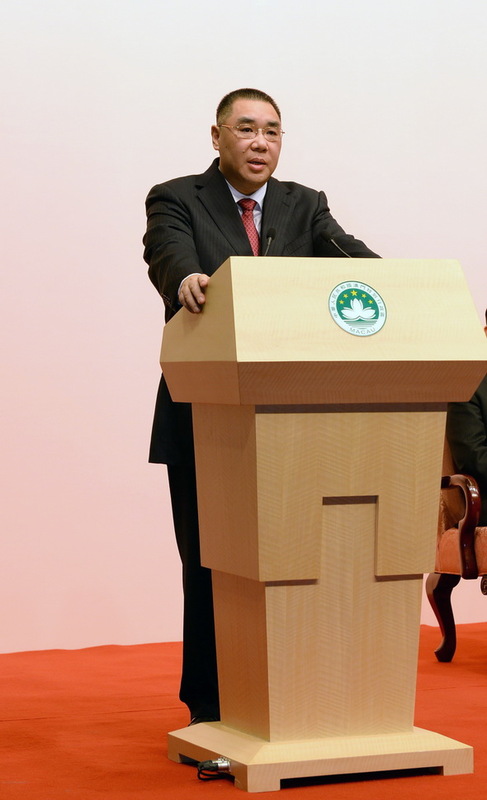 Chui, 57, was sworn in on Saturday as the fourth-term chief executive of the Macao SAR. He won a sole-contender reelection on Aug. 31, and was later appointed by China’s central government. 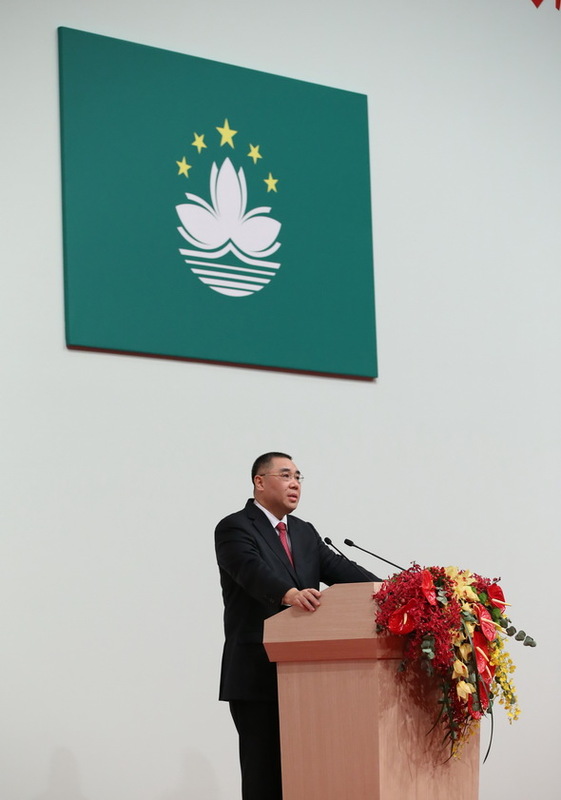 Chui Sai On was sworn in on Saturday of December 20 as the fourth-term chief executive of the Macao Special Administrative Region (SAR). 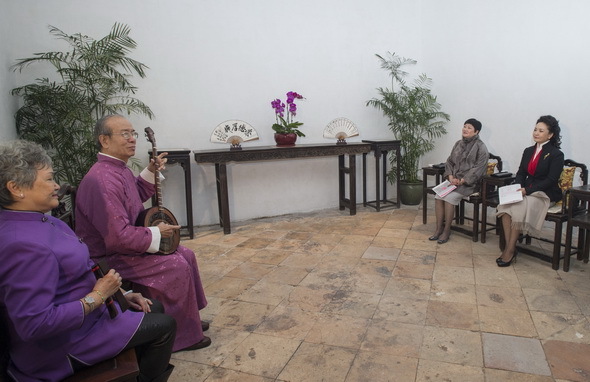 Born in Macao in 1957, Chui comes from a well-off and politically well-connected local clan. He completed his secondary education at the Ling Nam School in Macao, and continued his studies in the United States. Chui graduated from the California State University of Sacramento with a bachelor degree in community health with honor. He then obtained his master degree and doctor degree of public health at the University of Oklahoma. Before the establishment of the SAR, he had served as a directly-elected lawmaker on the Fifth Legislative Assembly from 1992 to 1996. 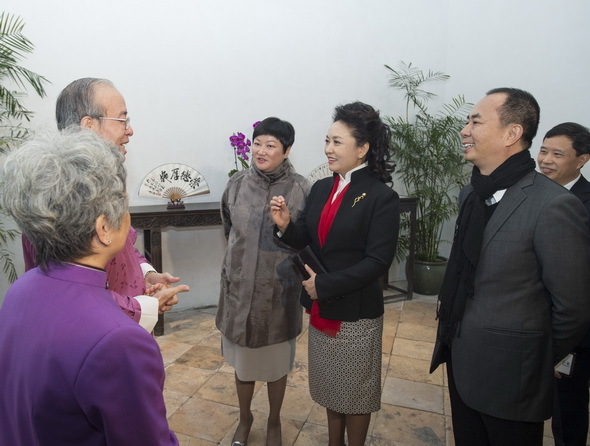 He also played an active role in various local community organizations, such as Executive Director of the Macao Kiang Wu Hospital Charitable Association, Honorary President of the Macao Nursing Association and Chairman of the Supervisory Board of the Macao Association for the Mentally Handicapped, before 1999. Chui won a sole-contender reelection on Aug. 31, and was later appointed by China’s central government as the fourth-term chief executive of the Macao SAR. At a press conference after the vote, Chui said that winning the re-election is the start to embrace new challenges for Macao as well as to implement his election program. He pledged to fully devote himself to implementing the principle of “one country, two systems,” while improving Macao people’s livelihood. 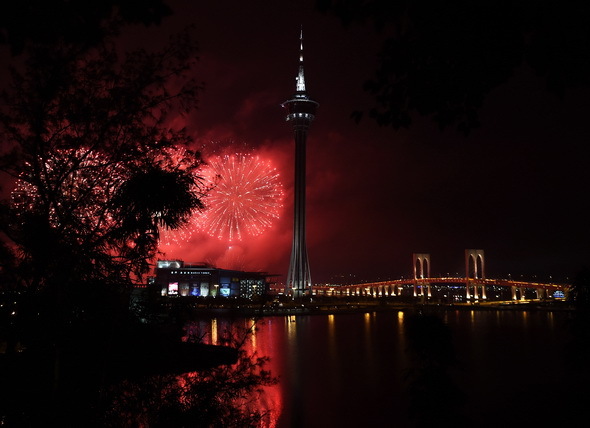 Macao’s gross domestic product (GDP) reached 413.47 billion patacas (51.76 billion U.S. dollars) in 2013, which could be translated into 87,000 U.S. dollars of GDP per capita, the second highest in Asia and the fourth in the world. Chui served as the SAR government’s secretary for social affairs and culture ever since the establishment of the Macao SAR in 1999. He succeeded Ho Hau Wah as the SAR’s third-term chief executive for a five-year tenure after winning an election in 2009. 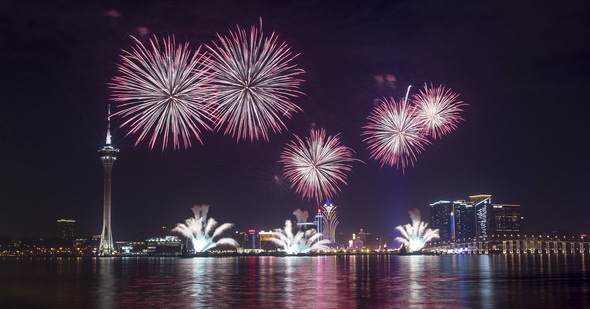 Over the past five years, Chui has been trying to diversify Macao’s economy by lessening the SAR’s heavy dependence on the casino gaming and developing other industries of cultural creativity, convention and exhibition, as well as tourism featuring hotels, food and restaurants, retailing and cultural heritage. 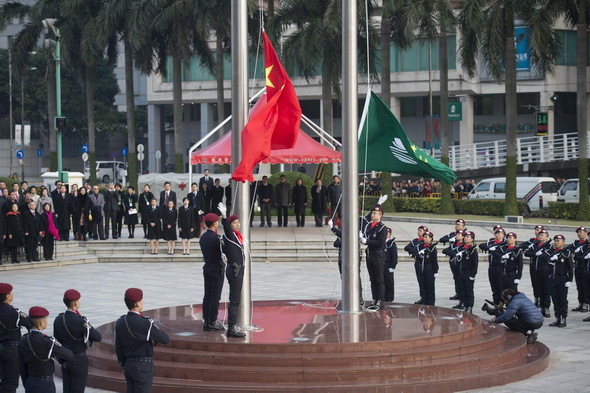 Following the swear-in ceremony on Saturday, Chui said the SAR government will continue to give priority to stable economic development and orderly adjustment of the economic structure. 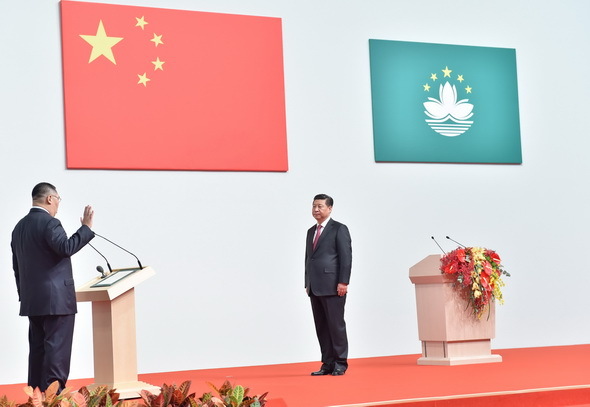 Chinese President Xi Jinping attended the inauguration of the fourth-term government of the Macao Special Administrative Region (SAR) here on Saturday morning of December 20. 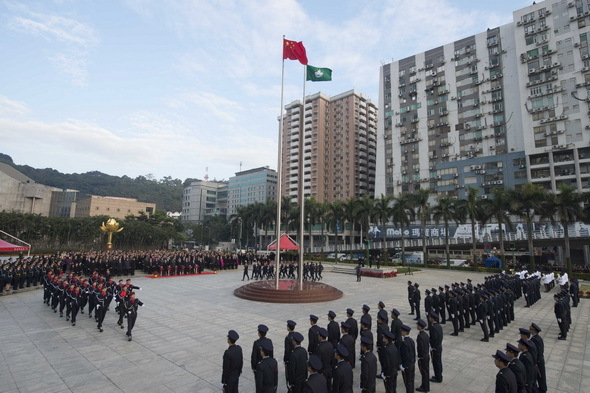 China officially resumed the exercise of sovereignty over Macao on Dec. 20, 1999, when the Macao SAR was established and the SAR’s constitutional document, the Basic Law, came into force on the same day. 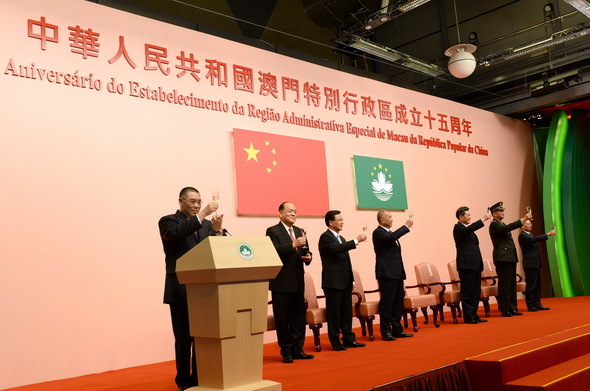 The Basic Law lays down a political and administrative framework of the Macao SAR. 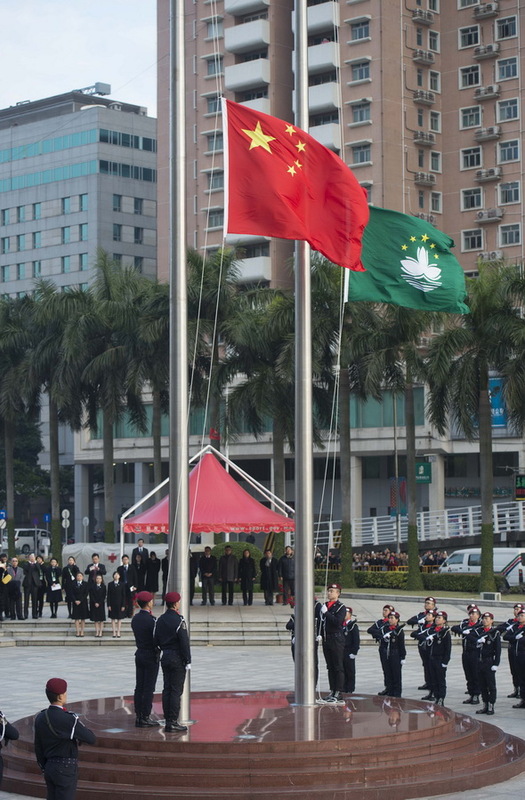 Under the principles of “one country, two systems” and “Macao people governing Macao,” the SAR exercises a high degree of autonomy in line with the Basic Law. Due to land reclamation along its coastline, Macao has grown in land area from 23.8 square km in 1999 to 31.3 square km. Macao has a population of over 630,000, with a population density of 18,900 per square km, and the northern part of the SAR is one of the most densely populated areas in the world. 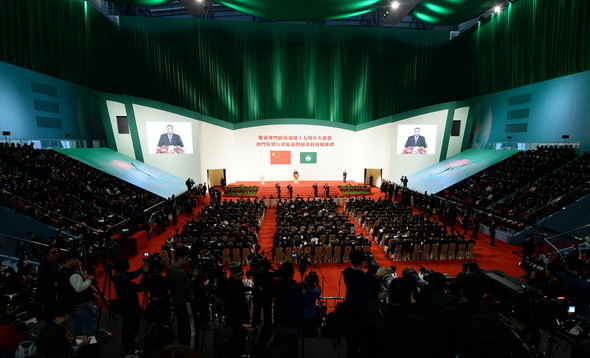 Though a small economy, Macao pursues an open economic policy. It has one of the lowest tax regimes in the Asia Pacific region. 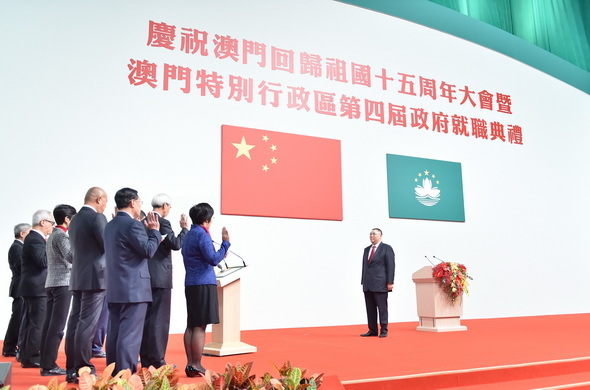 In addition, as a free port and a separate tariff zone, which has no foreign exchange controls, Macao is also an active player in the regional economy. 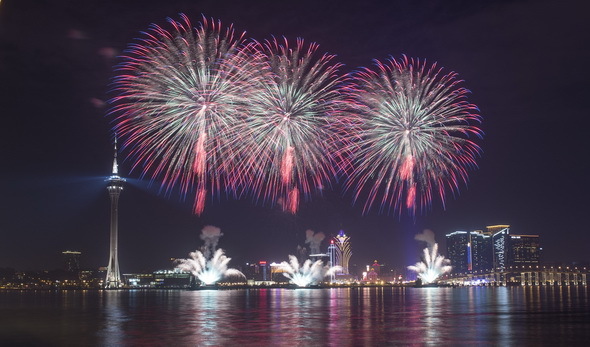 Firstly legalized in the mid-19th century, Macao’s casino gaming has developed a very close relationship with the tourism industry and become a pillar of local economy. In 2002, the government of the Macao SAR liberalized the gaming industry, bringing new momentum to Macao’s gaming sector and the entire economy. With the influx of foreign direct investment in the sector, the gross revenues of Macao’s gaming industry increased to 361.87 billion patacas (45.33 billion U.S. dollars) in 2013 from 14 billion patacas in 1999. Macao’s gross domestic product (GDP) reached 413.47 billion patacas (51.76 billion U.S. dollars) last year from 50.27 billion patacas in 1999, with an average annual growth of 16.2 percent. 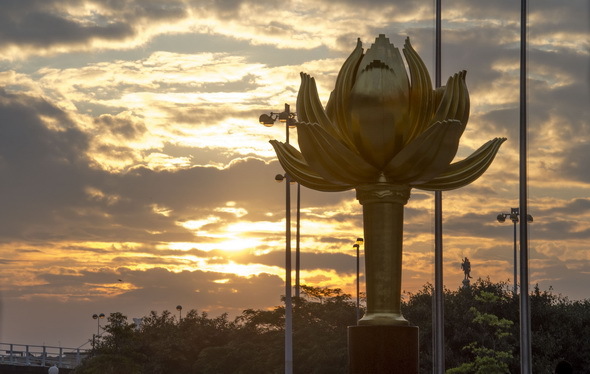 The GDP per capita jumped from 15,000 U.S. dollars in 1999 to 87,000 dollars in 2013, which ranks the second highest in Asia and the fourth in the world. Meanwhile, the unemployment rate has dropped from 6.3 percent upon Macao’s return to China in 1999 to 1.7 percent. The average monthly income has tripled to 15,000 patacas from 4,920 patacas and the life expectancy of local citizens has risen from 80.7 years in 1999 to 85, the second longest in the world. Aside from casinos, the SAR is also a popular travel destination. 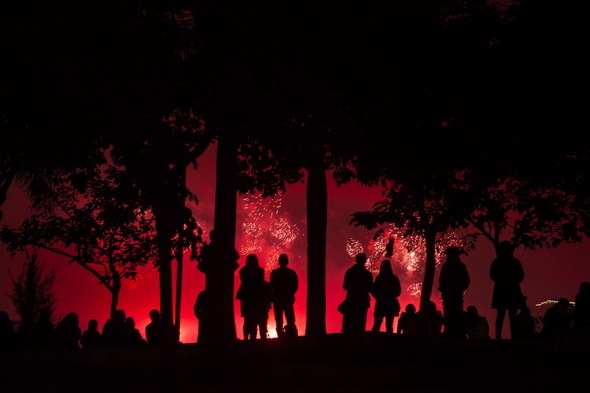 The SAR recorded some 29.3 million visitor arrivals in 2013. Macao boasts the unique assimilation and co-existence of Chinese and Western cultures. 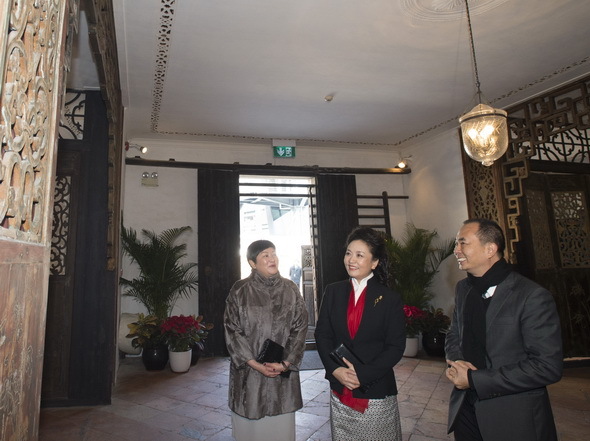 The Historic Center of Macao, a collection of over 20 locations, was inscribed on the UNESCO World Heritage List in 2005, making it the 31st designated World Heritage site in China.